Looking around at different blogs I have been noticing recipes for individual desserts served in shot glasses, jars… One of the blogs that I went to with a recipe that had a dessert such as this mentioned that she thought the desserts were more special for the individuals that they were served to. I thought that was such a true statement and decided to try it for myself. We had some family that came to visit and I decided to make chocolate mousse and change it up a little bit by serving it in some small glasses that I have. 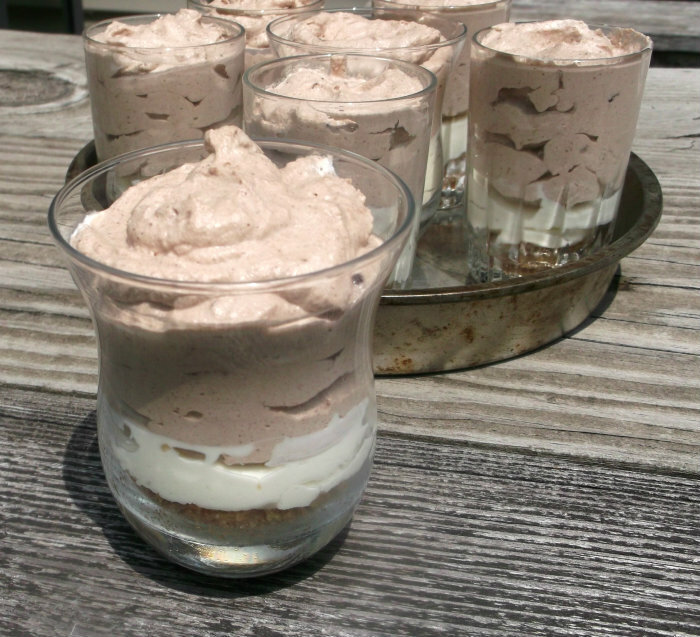 I used a chocolate mousse recipe that is my go to recipe; it is light and fluffy perfect for the summer months. I decided to add a little cream cheese that was dressed up with a few more ingredients for a little different twist. The dessert definitely was a big hit. I think that everyone thought the dessert was a little more special since it was served in an individual serving. Mix the graham crackers, sugar, and butter until well blended. Divide into 7 to 8 small glasses (should be about 6 to 8 ounces in size). Press the crust mixture into the bottom of the glass (I used a whisk that had a large handle to press my crust into the glasses). Set a side. In a medium bowl beat the cream cheese until light and fluffy. Add butter and vanilla and continue to beat until well blended. Add the confectioners’ sugar and mix well. To this add the cream a little at a time and beat until smooth. Pour this over the graham cracker crust; divided evenly. Set your dessert in the fridge while you make you mousse. In a small sauce pan, bring 1/4 cup of the cream to a simmer. Remove the pan from the heat and stir in the chocolate chips. Cover and set aside for about 5 minutes, then stir until smooth. In a large bowl whip the remaining 3/4 cup of cream with the confectioners’ sugar and vanilla until soft peaks form. Fold the melted chocolate mixture into the whipped cream. Spoon the mousse of the cream cheese layer and refrigerate until ready to serve. 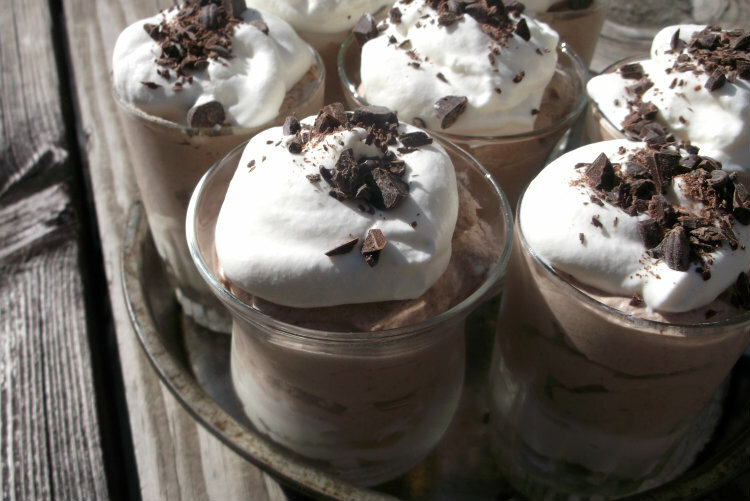 Top with whipped cream, chopped chocolate, or other favorite toppings. Sort of reminds me of a fluffy s’more in a glass. I know my kids will love this. Perfect little desserts. They look so delicious. 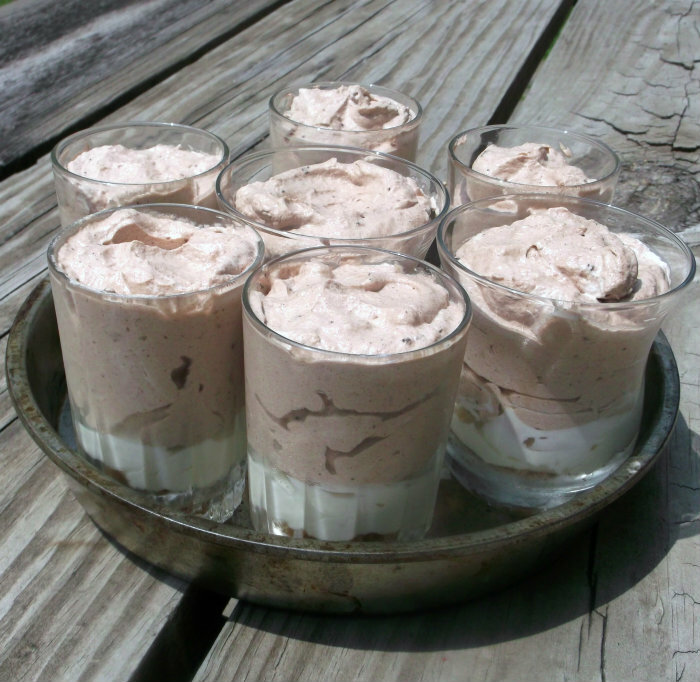 A mousse like this is perfect for individual servings. Heck, you’re going to spoon it into bowls anyway, so why not save the trouble? 😉 This looks terrific – thanks.